One thing I’ve noticed in what’s become my scholarly study on The Beatles is that one can find a wealth of information on the band, the individual members, and their chronological history. I may know more about John Lennon than I do my current president, and yet information on their manager, Brian Epstein, remains scarce. Pretty much everything I know about Epstein came from Peter Brown’s memoir, The Love You Make. I know I tend to hold up that book as the standard, but years and years after I’ve read it, the memory is fresh. There are Epstein-centric books, though, none of which I have read: among them a ghostwritten autobiography published at the height of Beatlemania that is likely sanitized to appeal to young fans, and a more in-depth history from Lennon biographer Ray Coleman. One could guess the lack in reading material about Epstein corresponds to the short time he worked with the band and the fact he died so young. I see pictures of Epstein and imagine a man beyond his years – always mature and serious – when in fact he was only six years older than John. We can imagine the stress of managing an extremely popular group aged him prematurely. Not only that, Epstein dealt with social prejudices that rendered him depressed and unable to sleep. A public figure comes out as homosexual today and it may not be a big deal, but in 1962 to be gay and Jewish in a tiny English port town equated to painting a large target on your head. The Fifth Beatle, a new graphic novel fictionalizing the life of Epstein, opens with the grim image of Epstein suffering a violent act in what appears to be a hustle gone wrong in a dank Liverpool alley. It’s a specter of shame and unrequited feelings that follow him through his short life, terrors he seeks to replace with success. Fans know the legend – Epstein had little to no talent management experience, but knew the music business through the family chain of record shops. He attends a live show at the Cavern after hearing of the Beatles, and you know the rest. 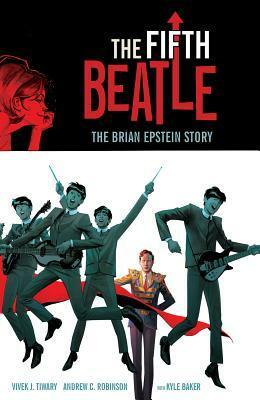 The Fifth Beatle vividly recreates this and other key scenes in Epstein’s relationship with The Beatles with sharp characterization and moody colors. Unlike another graphic novel reviewed here (Baby’s in Black), representations of main and supporting players take on appearances that match their personalities – genuine and assumed. Brian comes off as enthusiastic despite weary expressions, John is sharp and smirking, and Paul exudes a gee-whiz cuteness. Darker scenes position people like Colonel Tom Parker in a demonic setting and Ed Sullivan as wooden (you’ll see it soon enough), and Yoko Ono in an eerie cameo. All through the adventure, Brian has a right-hand woman named Moxie. Whether she existed as a composite of personnel assisting the band and Epstein or as a figment of the imagination (not unlike Jessica Lange’s angel/confessor in All That Jazz) remains up for debate. Her role in the story serves to heighten one thing we’ve always known about Brian Epstein – he was lonely. He had friends and family, and while he may not have been the savviest of managers he had the respect of four lads from Liverpool for a time. Nonetheless, he had no partner with whom to share his success, and that knowledge makes this story all the more bittersweet. His premature death in 1967 is arguably the beginning of the end of The Beatles – that’s something I’ve believed for a long time. We can blame Yoko, but the smoke ignited when the band found themselves without management and couldn’t easily decide on a successor. Anyway, I’ve followed the progress of The Fifth Beatle for the better part of a year and looked forward to reading it. Overall, I liked the story and the illustration. Fans will easily spot the lyrical Easter eggs in the dialogue, but I find things like that take me out of the story and make it a challenge to take seriously (Clockwork Angels had this same issue). I will admit, too, there are known scenes of Epstein’s life that didn’t make it to this book. George is barely represented here, Ringo even less, and Pete Best isn’t on the radar…unless you count blurred background Cavern images. Also missing or downplayed are moments of John’s cruel humor, the anti-Semitic and anti-gay slurs that reportedly drove Epstein to tears. The Fifth Beatle is a welcome tribute to a figure sometimes marginalized in Beatles history. Petitions to get Epstein inducted as a non-performer in the Rock and Roll Hall of Fame continue to circulate, and perhaps a book like this will bring more attention to the cause. Kathryn Lively is the author of Killing the Kordovas, The Girl With the Monkee Tattoo, and The Rock and Roll Mysteries.